On 8/09/2004 at approximately 1100 hours, Mono County Sheriff's Department received a call for a missing backpacker/climber in the Mt. Ritter area. On Sunday, August 8, the subject, Otto Loenneker, 59 years old of Los Gatos, Calif., had been hiking the routes below Mt. Ritter with his friend, John Dickinson, 56 years old of New Hope, Minn., when they became separated. Dickinson returned to camp and waited for Loenneker to return. The next morning, August 9, Dickinson hiked out and called the Mono County Sheriff's Department. Mono County Sheriff Search & Rescue teams were called out shortly thereafter. At approximately 1330 hours the first Mono County Sheriff Search & Rescue team started to hike into the search area via Agnew Meadows. At approximately 1630 hours the second Mono County Sheriff Search & Rescue team was inserted via Air National Guard Blackhawk helicopter out of Mather Air force Base. Approximately one hour later Loenneker was spotted lying in the rocks at the bottom of the southeast glacier below Mt. Ritter. Loenneker apparently fell while traversing the glacier and sustained severe head and body trauma, and was pronounced dead at the scene. He was not wearing crampons and did not have an ice ax. Both Search & Rescue teams spent the evening lowering Loenneker out of the couloir. At approximately 0845 on August 10, Loenneker and both Search & Rescue teams were evacuated via Air National Guard Blackhawk helicopter. 1. On a trip I was on in July, a climber slipped on a class-2 sloping slab while approaching a peak and injured their shoulder. They hiked out okay, but the injury was very painful and prevented any further climbing that weekend. 2. On a trip I was on in August, a climber fell in a very loose class-2 scree gully when he stepped on a boulder weighing several hundred pounds and it released. He tumbled down with the boulder for about 20 feet, somersaulting once, knocking other rocks and rubble loose. He received some large bruises and avoided a severe head injury only because he was wearing a helmet, which ended up cracked and scratched. Interestingly, there were three of us on the climb, and he was the only one wearing a helmet. On my next climb, I wore a helmet, though Aaron pointed out to me that his accident happened on terrain where most of us would be carrying our helmets on our pack instead of wearing them. On August 22, 2004 at 1158 the Inyo County Sheriff's Office received a cell phone report that a climber had fallen on Middle Palisade, west of Big Pine. The Inyo Search and Rescue Team responded to Big Pine where they met with the Forest Service helicopter. 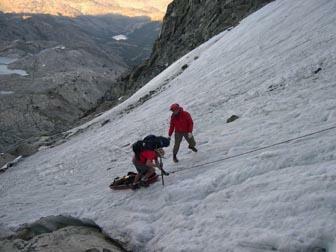 One rescuer flew into the location arriving just after other climbers reached the victim. They discovered that 31 year old Brian Reynolds of San Diego had died during the fall. The first SAR climber reached Reynolds and confirmed the fatality as other SAR members were inserted nearby. Due to unstable wind conditions the SAR team camped over night, and on Monday morning Reynolds body was flown to a LZ set up at Glacier Pack Station, and released to Coroner Leon Brune. While that route is fairly steep and has plenty of loose rock, I've never seen anyone rate it harder than class-3. 4. On a Labor Day trip I was on, we ran into a pair of climbers who had climbed North Pal via the Leconte route without incident. But then, while crossing a level boulder field on the way back to their camp near Thunderbolt Pass, one of them got his foot caught under a large boulder when it moved. He and his partner were unable to free it until the partner sat down and pushed on the boulder with both feet. The first climber escaped with a bruised, possible sprained ankle. He said that if he'd been alone, there was no way he could have freed himself. Perhaps he went farther south on the glacier, where it's a bit steeper, or hit an icy patch, or just took an awkward fall that got out of hand and tumbled him down onto rocks. I'd appreciate more details if anyone has them. One lesson I take from these six accidents is that when climbing, it's just not good enough to be super vigilant on technical terrain and then relax elsewhere. A basic level of vigilance is needed at all times, as well as an awareness that dangers can lurk on relatively easy terrain, such as rockfall from cliffs or climbers above you, an icy patch on a snowfield, or big boulders that move unexpectedly. As a climbing friend once told me, "Accidents don't always happen to the other guy." A Los Gatos businessman died Sunday when he fell at least 75 feet to his death while scouting a hiking route to the summit of Mount Ritter in the Sierra. Otto H. Loenneker's body was recovered shortly before dark Monday by Mono County volunteers after it was spotted by a helicopter pilot dispatched from Mather Air Force Base near Sacramento, said Erica Stuart, public information officer with the Madera County Sheriff's Department. Loenneker and his climbing partner, whose name was not disclosed, split up at noon to identify a route to the summit, Stuart said. Although it was 104 degrees on the valley floor, on the mountain it was probably in the mid-30s and fair. When Loenneker didn't return to camp at 3 p.m. as expected and his partner was unable to find him nearby, he immediately called the Mono County sheriff for help. The accident site is in Madera County, but more accessible from Mono County. The 59-year-old Danish-born Loenneker apparently hit an ice field at 11,500 feet and tumbled at least 75 feet to his death on the eastern slope of Mount Ritter. He was found at the bottom of the ice field with a severely fractured forehead, a broken leg and numerous lacerations, Stuart said. From all appearances, the two climbers did everything by the book. "You could tell he was seasoned. He was prepared to do this," Stuart said. "But this kind of thing can happen. All it takes is one horrible slip." Loenneker owned his own energy and information technology consulting business. Mount Ritter is in the heart of the High Sierra, east of Yosemite National Park. Naturalist John Muir is the first person known to have scaled the 13,140-foot peak in October, 1872. Muir dubbed it "king of the mountains of the middle portion of the High Sierra." Its glacial snowmelt feeds four major river systems. This is something I've been thinking about. Climbers are not always completely clear on the difference between the "technical difficulty" and the "level of risk". An example would be climbing 5.9 rock with good belays may have a much lower "level of risk" than climbing unroped on class 3 to 4 terrain. An accident happened on a trip I was on a few years ago that I've not seen reported. While attempting a California 14er, the most experienced climber in the group took a four hundred foot fall on steep class two snow. All of us there now know what the expression "bouncing like a rag doll" means. Fortunately the climber "washed out" on a big rock and escaped with only huge bruises and road rash on the arms and legs. Casualness on what for this climber was easy terrain led to the accident. One of the many reasons I prefer NOT to use crampons when others DO use them. I prefer falling (for real) several times per season. Most people practice on terrain where they would stop without an ice axe. How many have actually fallen on steep snow with a full pack? Steep HARD snow? With someone else tied to you? These are things that need to be practiced under realistic conditions so you know where the limits are. I do a lot of wandering on slabs, boulder hopping, bouldering, scrambling, and just general fooling around on places that look neat. So do most of the people I hike/climb with. I don't worry much about injuries that are (or will be) painful but don't require rescues. I figure the risks are in the same ballpark as bike accidents and a whole bunch of life in general. For me, it's better to be out in the mountains having fun rather than than sitting at home in front of the TV. I think the risks are reasonable and I think my partners are willing to take similar risks and/or put up with the increased risks of my fooling around a bit more than some people do. Sounds like a good topic to discuss after dinner. Thanks for the reminder. That's not to say I/we can't learn from the troubles that others discover. Just that I don't expect to eliminate all the risks and I think the ones I'm taking are reasonable for me. Note that I can't/shouldn't make the acceptable-evel-of-risk decision alone. It depends upon the people I'm with at the time. Probably time to (re)read ANAM again. Does anybody know if the insurance industry has any good data on the risks of hiking, scrambling, or climbing as compared to couch-potatoing? > Pass, one of them got his foot caught under a large boulder  when it moved. > was no way he could have freed himself. I'm sometimes amazed at how many big boulders rock a bit when I step on them. Or maybe more than a bit. Some of them are amazingly big. They go THUD rather than dink. I mostly worry about falling far enough to get seriously hurt (no soft landings in talus) or breaking a leg because it gets trapped behind a rock or in a hole if/when I do fall. Double that when you have a heavy pack. The guy who lost his hand/arm behind a rock in Utah earlier this summer was on TV recently. Add his story to your checklist if you are going to be hiking alone. "We were about 30 minutes from our camp in the Palisade Basin. The major talus was behind us and these boulders, while big, were not enormous car-sized blocks, but maybe more like big 36 inch TVs. I stood on one with a nice flat top and it instantly pivoted. My foot fell through very fast and then the boulder kept rotating until my foot became totally trapped underneath. The pain was intense. Besides pinning me down just above the ankle bone, it also caused my foot to be twisted at a weird angle. I tried moving the boulder with my bare hands but it was useless. Fortunately I was not alone and my climbing buddy hearing my cries realized something serious was wrong. I wasn't your normal "oh s**t" type curse. I was loud! He came quickly and tried to move the boulder with his hands, but only succeeded in bring it up a fraction before letting go and causing the pain to get much worse. I was starting to think about all those poor unfortunate hikers who had gotten trapped and their outcomes. In my case there was one big difference I was with someone. Arturo switched to his legs and pushed really hard, in a leg press type maneuver. I reckoned I had only one or two shots to drag my leg from underneath the boulder before his strength gave in, so I heaved my stuck leg with both hands and it slowly came free. Instantly the pain stopped, as did the noise ;-) Thank goodness for Arturo's bootcamp sessions! Needless to say we cancelled our Sunday plans for Starlight, but slowly hiked out instead. The ankle and lower leg are still pretty swollen, but nothing is broken. " > I've never seen anyone rate it harder than class-3. I know a guy who was a member of that climbing party. He was so shook up he says he'll never climb mountains again. I think they were competent because just a few weeks earlier the guy I know had climbed the East Buttress on Whitney. I don't know what happened other than their group stopped to allow a descending group to pass and apparently during the co-mingling of the two groups this guy took the huge fall. A couple of years ago one of Patsy's (youngish) cousins was found dead on the sofa in front of her TV by her brother. She had died of a heart attack. You can't closet yourself and hope you're never going to die, because you are going to die sooner or later. Hopefully later though, eh? You have to make the best of life and that does, for most of us, necessitate taking some calculated risks. > taking  some calculated risks. Very true indeed, Richard, I've had many near misses in the mountains and on the roads getting there (and back) or heck, even in urban traffic. And if mountains aren't risky enough, how about being the victim of a hate crime in Hillcrest, domestic violence at home or an innocent victim of gang warfare like happened a couple blocks away from my house to a couple of teenage kids a couple of weeks ago. And let's not dive into hurricanes, earthquakes, lightening strikes or terrorists. In any event, hopefully, you've made your peace with God/Jesus before your demise. Well, it's that time of the year when snow and neve starts icing up (or is already iced up). Sans axe and crampons, an icy angle of 30 degrees is plenty to take a good ride to the afterlife. Regardless of roughness and pits, once you start going on ice, forget it. Self-arrest on ice once you're moving is impossible at best. Best to be providing vigilant self-belays, which is pretty damn hard to do without crampons and axe.